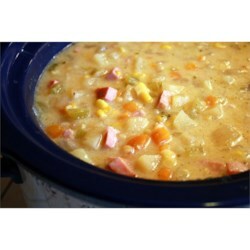 In a slow cooker, place the potatoes, onions, ham, celery, corn, butter or margarine and salt and pepper to taste. Add water to cover and two bouillon cubes. Cook on low setting for 8 to 9 hours and then stir in the evaporated milk. Cook for 30 more minutes.